ACTRA Members are the Champions, My Friends! Pictured above is the 2018 IPA negotiations team on ‘Day One’ November 1 to include ACTRA’s bargaining team with supporters from DGC, IA, SAG-AFTRA, NABET, USW, WGC and performer managers and agents: Front row: L to R: Alistair Hepburn, Peter Keleghan, Blair Young, Tristan D. Lalla, Stephen Waddell, Theresa Tova, David Sparrow, Debra McGrath, Richard Young, Dalmar Abuzeid; second row: Ferne Downey, Leah Pinsent, Angelica Lisk-Hann, Art Hindle, Colin Mochrie, Jess Salgueiro, Joey Klein, Wendy Crewson; third row: Gail Haupert, Paul Dzenkiw, Lesley Brady, Linda Kash, David Gale, Sugith Varughese, Angela Asher, Joanne Boland, Sue Milling; fourth row: Alan Goluboff, Tereza Olivero, Erin Phillips, Daintry Dalton, Ron Lee, Joel Keller, Keith Martin Gordey, Shawn Doyle, Ken Neumann, Moona Syed, Taisa Dekker; fifth row: Anne Paynter, Tina Alford, Max Wagner, Laurie Channer, Victoria Shen, David Forget, Cathia Badiere, Laurie McAllister, Clare Johnston; sixth row: Jonathan Ahee, Jayson Mosek, Barbara Larose, Elichai Shaffir, Cindy Ramjattan, Jennifer Goldhar, Jennifer McLaren, Mai Vo, Olga Redriguez-Aguirre, Champi Sevathiar, Tania Cardwell, Megan McGregor, Amy Hines, Carmela Algeri, Christopher Hinves. 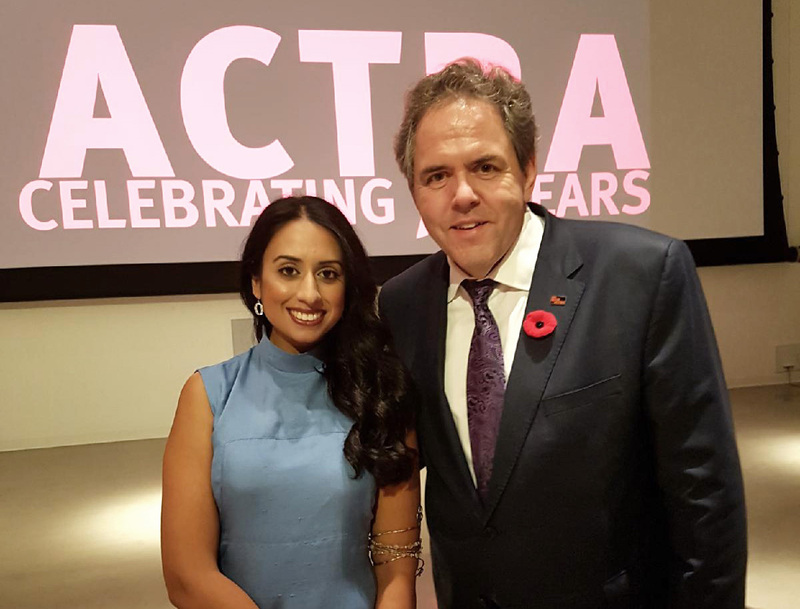 Two thousand and eighteen was a year of true celebration marking 75 years of impressive ACTRA advocacy on behalf of performers and the arts in Canada. It was also a year of important negotiations that led to better compensation and respect for all. And, it was a chance to meet and hear from talented ACTRAvists from every branch, who are excelling at their craft, projecting our Canadian talent to the world and working hard for their fellow members across this great land. First, to every elected member of the branch councils and National Council and to every passionate performer who gives of their time to sit on a committee or advocate for a cause or volunteer at an event, I thank you on behalf of our 25,000 members. You make a difference and are helping us build a stronger union and industry for future generations. Last year saw far too many champions to name here… but let’s give it a try. Shelley Thompson was selected as the recipient of the Woman in the Director’s Chair Feature Film Award, which will support the creation of her first feature to be shot in Nova Scotia this summer. This win underlines her exceptional work starring in numerous films and TV roles, including eleven seasons on The Trailer Park Boys. And if she wasn’t busy enough, Shelley formerly served on the ACTRA Maritimes Council and is past Chair of the Women’s Committee. Don Jordan opened doors for a generation of diverse performers in Canada and received the 2018 ACTRA Montreal Award of Excellence. An accomplished actor, singer, dancer and choreographer, Don served as President of ACTRA Montreal from 2007 to 2016. Industry mentor Jennifer Clement received UBCP/ACTRA’s Lorena Gale Woman of Distinction Award. As Head of the Acting Department at the Vancouver Film School, Jennifer’s passion is to train, nurture and empower the next generation of performers. She spoke passionately at the UBCP/ACTRA Awards Gala about the advancement of women in our industry. Two thousand and eighteen saw ACTRA Toronto Councillor Tantoo Cardinal win both the Toronto Film Critics Association Award and the Whistler Film Festival Award. This internationally recognized star continues to advocate for indigenous performers and for all diverse members and speaks to advance the true history of Canada through cinema. At 19, Mustafa Alabssi is one of ACTRA Saskatchewan’s newest members. He has an incredible story to tell. As a deaf performer and a Syrian refugee, he has faced his share of challenges, however, just three months after his first stage play, he was cast in the Netflix series Black Summer. The “genuineness” of his performance won him the role. I’m sure we’ll see much more from Mustafa. Sarita Van Dyke and David Sparrow at the 2018 ACTRA Ottawa awards gala. Heartland won the 2018 Alberta “Rosie” for Best Dramatic Series and… returning in 2019 for season 12, is the longest-running one-hour drama in Canadian television history. Congrats to Amber Marshall, Graham Wardle, Michelle Morgan, Shaun Johnston, Alisha Newton, Nathaniel Arcand and to all of the exceptional ACTRA Alberta members who make this series so compelling. Out on the rock, Robert Joy was honoured with the 2018 ACTRA Newfoundland & Labrador Award of Excellence. A true gentleman, Robert is known for his mentorship of local performers as he often returns home to support the film work of emerging artists. Television audiences may best recognize him for his role-playing Sid Hammerback on CSI: NY for eight seasons or from the hit series Codco or from a little movie he did with Madonna called Desperately Seeking Susan. Rita Shelton Deverell was our 2018 ACTRA National Woman of the Year. She has done so much throughout her career to promote diversity in every corner of the media. In the coming year Jayne Eastwood’s five-decade long career will be celebrated as she receives the ACTRA Toronto Award of Excellence. A much-welcomed lobbyist on Parliament Hill, Jayne speaks strongly on ACTRA’s behalf and is known industry-wide for roles in Goin' Down the Road, SCTV, The King of Kensington and so many more. Montreal’s Jay Baruchel is the 2019 ACTRA National Award of Excellence winner this year. Starting as a child performer, he is now a celebrated writer and director with a passion for Canadian storytelling. Last fall you voted and made a difference. The team of Blair Young (Alberta), Tristan D. Lalla (Montreal), Shawn Doyle (Toronto), Theresa Tova (Toronto) and Richard Young (Toronto), along with our Alternates, Eleanor Noble (Montreal), Catherine Disher (Toronto) and David Gale (Toronto), negotiated a new Independent Production Agreement (IPA) with the help of Observers Paul Dzenkiw (UBCP/ACTRA), National Vice President Keith Martin Gordey, Toronto Background Advocate Shereen Airth, stunt performers Angelica Lisk-Hann and Steve Shackleton, and voice actor Linda Ballantyne. It was a pleasure to work with this thoughtful group and I thank each of them for their wise counsel and for the many late nights. Thanks also to those members who shared ideas at focus groups across the country. The advances we made during this round of negotiations will serve our members well into the future. As chair of the negotiating committee and on behalf of our 25,000 members, I extend our deepest gratitude to our 2018 ACTRA IPA negotiating committee and to our dedicated and knowledgeable staff for a tough job done well. 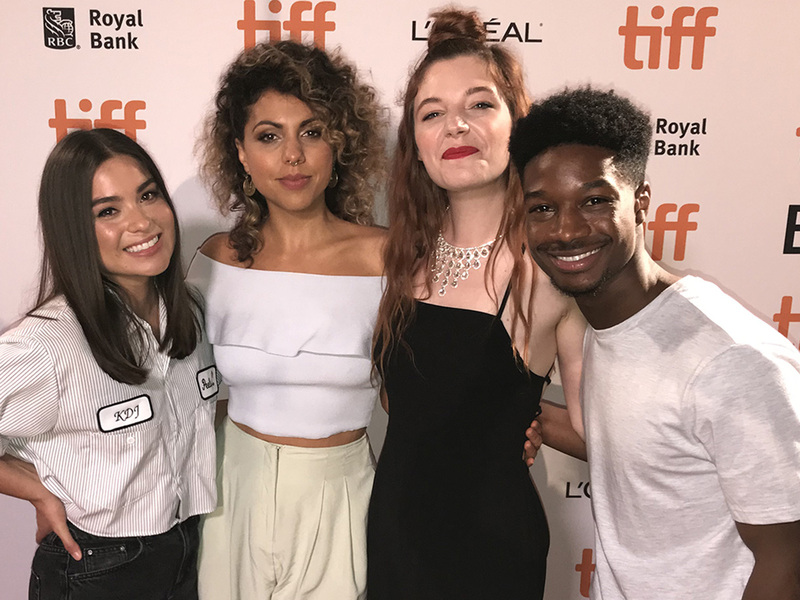 ACTRA members Devery Jacobs, Jess Salgueiro, Lamar Johnson and Michaela Kurimsky were named #TIFF18 Rising Stars. In this first digital issue of ACTRA Magazine, you’ll read about many more members who are doing selfless work on behalf of us all. Please check out our applause section and then, I bet you know of many others who are champions for our industry. So we encourage you to share your stories and accolades about your peers, our exceptional members – be sure to tag us @ACTRAnat and include the hashtag #actra. Two thousand and nineteen promises to be an exciting and challenging year. With new studios in the planning stages in many jurisdictions, we must keep our chops up and be ready for when work opportunities come a-knockin.’ With a federal election also in the offing, we must all be active, vocal and diligent. The future of our member-built union and our industry relies on the efforts of ACTRA members just like you.